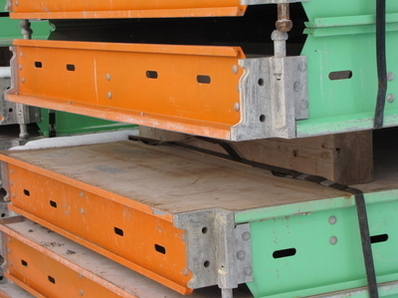 TABLA concrete shoring system has just now become available for sale. Over 10,000 square feet of TABLA shoring in Excellent Condition and at a Great Price. Please reach our sales department to discuss TABLA Shoring further. Tabla Shoring offers more erection, stripping and financial satisfaction than conventional shoring systems. Tabla Shoring begins with rigid panel construction that enhances handling. The sharply honed Tabla Shoring Prop with its integrated drop-head puts you in control and helps to ensure confident erection and ease of stripping, while back-propping remains undisturbed. These advantages result in a high rate of production. The Tabla shoring Panel and Prop with engineered automatic wind lock provide job safety with a rigid interlocking system that prevents tipping during erection even without bracing. The Tabla shoring system is designed to withstand wind loads near hurricane force. The standard Tabla Modular Shoring System is a unique system erected from the working floor up to a height of 16 feet 6 inches / 5030. Tabla shoring can accommodate drop bands, drop heads and its design allows for all interruptions. Tabla shoring minimizes the number of components required for the erection process.